The blackberry is a wonderful-tasting fruit that is easy to grow. However, blackberry plants can spread underground and create dense thickets that may need thinning. If you are relocating plants or have just received some transplants, it is important to replant the cuttings properly, to guarantee a fresh crop of berries in the spring. Thoroughly water the area where the blackberries are currently growing. Soaking the soil makes it easier to separate the plants and prevents damage to other plants. Position your shovel about 4 inches away from the blackberry plant you want to transplant and push the blade straight down into the soil avoiding the plant's root crown or rhizome. Pull the handle of the shovel toward you. This should bring the root crown of the target plant to the surface. Gently pull the blackberry plant from the ground, keeping as much of the root system intact as possible. Locate a place in the garden with compost-enriched soil that has enough room for the blackberry plant to spread. Blackberry plants need an area about 4 feet by 4 feet. Transplant the blackberry plant at the same level it was planted in the previous location. Trim off dead canes and trim live canes by three-fourths. 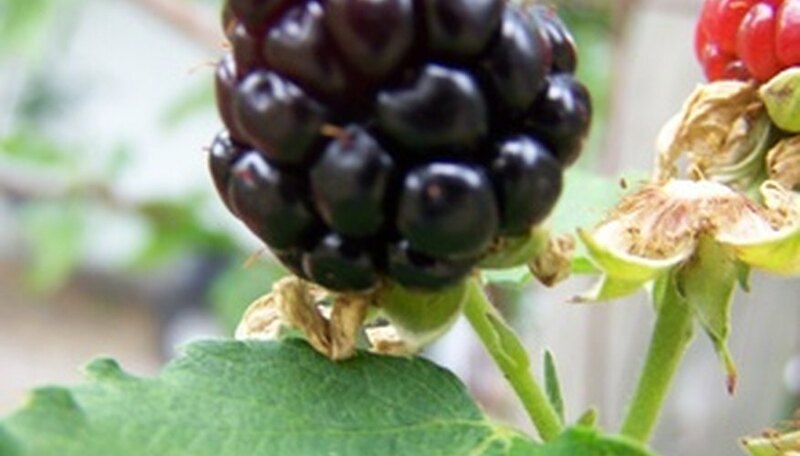 Prepare the growing area for the fertilizer in early spring when the blackberry plants break dormancy. Dig a 3-inch-deep trench approximately 1 foot away from each row of blackberry canes with the hoe. Sprinkle the fertilizer along the prepared trench, applying approximately 5 pounds of fertilizer for each 100 feet of blackberry canes. Cover the trench lightly with soil. Water the soil generously immediately to help the fertilizer soak into the soil. Watch the blackberry plants as the growing season begins. If you notice yellow foliage and stunted growth, apply approximately 1.5 pounds of ammonium nitrate for every 100 feet of blackberry canes along the same trench line. Apply the ammonium nitrate when the blackberries begin to bloom, cover the trench lightly again and water the soil generously. Kill existing blackberry plants by spraying the canes and leaves with an application of a systemic herbicide containing glysophate. Wait until the plants have died. Dead blackberry canes will turn brown, and the leaves will become brittle. Mow down blackberry plants to ground level using a tractor with a mowing attachment and dispose of the canes. Do not compost canes, because they still have herbicide residue on them. Paint the exposed stems with glysophate. Observe the area where you have cut back the canes for new plants to emerge. Dig up these plants to remove the roots and nodes from the ground. This process is known as grubbing. Space the bushes 4 feet apart the row in small areas or when using the blackberries as a border shrub. Space them up to 6 feet apart in the row for larger areas or if you are planting multiple rows. Plant the rows 8 to 10 feet apart to allow easy access for harvesting as well as providing proper air circulation around the plants. Space rows as little as 3 feet apart in small yards or if you will only be handpicking the fruits. Mulch the area between each row thoroughly to prevent weed growth. Apply at least 4 inches of organic mulch or lay down sheets of plastic mulch. Weeds take advantage of the fertilized soil between blackberries, but blackberries do not compete well with the weeds. Line the pie plate with one 9-inch pie crust. Set aside a top crust for the blackberry pie. Place the berries into a colander. Gently rinse with cool tap water. Let the colander sit in the sink while the water drips out away from the berries and preheat the oven at 350 degrees. Measure 1/2 to 1 cup of Splenda sugar substitute into a small mixing bowl. Add in 1 to 1 1/2 tbsp. of tapioca powder. Mix the powder with the Splenda using a rubber spatula until they are thoroughly blended together. Pour the berries on several paper towels to absorb any remaining liquid. Lift the towels and pour the berries into a mixing bowl. Gently fold the Splenda and tapioca mixture into the berries with the spatula. Fill the crust lined pie plate with the blackberry mixture. Dot with an optional 1 tbsp. of cold butter or margarine that is cut into bits. Top with pie crust, crimp and cut several slits in the top. Bake 40 to 60 minutes until golden brown. Blackberry plant spacing is based on the type of cultivar. Trailing, vine-like cultivars require 4 to 10 feet between each plant and 8 to 10 feet between rows. Upright blackberry plants need less room between each plant. Place plants about 4 to 6 feet apart and allow 8 to 10 feet between rows. Put on the gardening gloves to protect your hands from the sharp brambles. Use pruning shears to cleanly cut the stump off near the ground. Remove them as quickly as possible so the roots don't start to spread. Take a shovel and dig deep down the side of the stump to pull it out. You want to completely remove the stump. This will probably rip up the roots, so you'll need to hand-pick the root fragments out where ever you can find them. Discard everything that is dug up. Boil two gallons of water and pour it over the area that you removed the blackberry bush from. Do this over the course of the day, about three to five times. Doing this helps waterlog the root system and any parts left, which will make it start to rot. Use a till on the area over and over to get rid of any root pieces, rhizomes and fragments from the bush. Do this multiple times over the course of a couple days, and discard whatever is dug up. Clean the blackberry plant in late winter or early spring before the season's new growth begins. Prune any damaged canes back to the ground. Prune the weakest, smallest vines on your blackberry plant until you are left with four to eight of the strongest vines. Prune an underproducing blackberry plant's vines back to 24 inches in height in late winter before new growth begins. Next season, the canes will grow back thicker, branch out and create more wood on which to produce more fruit. If the canes are less than 2 feet in height, simply prune off the top inch or so of wood on the vine. Prune fruiting canes to the ground as soon as they are done fruiting for the season. Blackberries only fruit on each cane once. Cut off the canes (branches) that produced blackberries after harvesting. These canes, which are called floricanes, will no longer produce fruit and will die after the first hard frost. Use hand held clippers to do this job and remove the debris away from your plants. Prune off all but 6 to 12 of the canes that did not fruit this year. These canes, which are called primocanes, will produce fruit next year. Choose the healthiest and strongest looking primocanes and try to evenly space them out. Remove the ties if you tied the primocanes to a trellis or other support system and lay the canes on the ground. Cover the primocanes with straw after the first hard frost (also called a killing frost), which typically occurs when temperatures dip below 30 degrees Fahrenheit for at least two to four hours. Cover all the trailing canes with about 3 to 4 inches of straw. You can use another organic mulch, such as pine needles or leaves, but straw can be easily removed in the spring. Blackberry bushes are not evergreen, but deciduous, meaning they lose their leaves each fall, according to the University of Florida Extension office. Blackberry bushes grow best in temperate climates, although some wild blackberry bushes are found in Florida. Choose long stems that have not borne fruit in the middle of September. Look for vibrant stems with no imperfections. Bend the stem toward the soil. Dig a hole 6 inches deep where the tip of the stem strikes the soil, then bury the tip. Pat the soil firmly around the buried stem tip. Place several stones over the site to hold the stem in place. Water the buried stem well. Check the stem the following spring and you should find roots growing beneath the soil. Cut the buried stem 12 inches above the soil surface with pruning shears. Dig up the new thornless blackberry plant with a trowel. Do not disturb the new roots. Transplant the specimen to a sunny location that is at least 4 feet away from other blackberry plants. Drive a 6-foot wooden board into the ground with a hammer at each end of the row. Fasten heavy-gauge wire between each board at 3 feet high and 5 feet high. Position the canes to grow between the two wires so the blackberry canes do not bend into the walkway. Remove the top 1 to 2 inches of the new primocanes with pruning shears when the canes reach 30 to 36 inches tall. This encourages the development of branches along the main canes. These branches will produce fruit next year. Remove the floricanes at ground level after collecting the berries. These canes will dry out and die at the end of the growing season. Thin the primocanes to three or four canes per plant when the blackberry bushes are dormant in the late winter. Leave only the strongest canes. Prune all the branches back to 12 to 18 inches long. This will create vigorously growing canes with productive branches. Brazos is an upright thorny blackberry plant that produces well in south Georgia. It is not a good choice for the mountainous areas of Georgia, because the fruit is susceptible to damage at 5 degrees F or lower. The medium to large blackberries are high in acid and best used for jams, jellies and baking. Cheyenne is an upright thorny blackberry plant that produces well all over Georgia. The blackberries are medium to large and firm with a sweet flavor and a moderate amount of acidity. They are good for eating fresh and freezing. Kiowa is a relatively new variety of blackberry plant that grows well in Georgia. 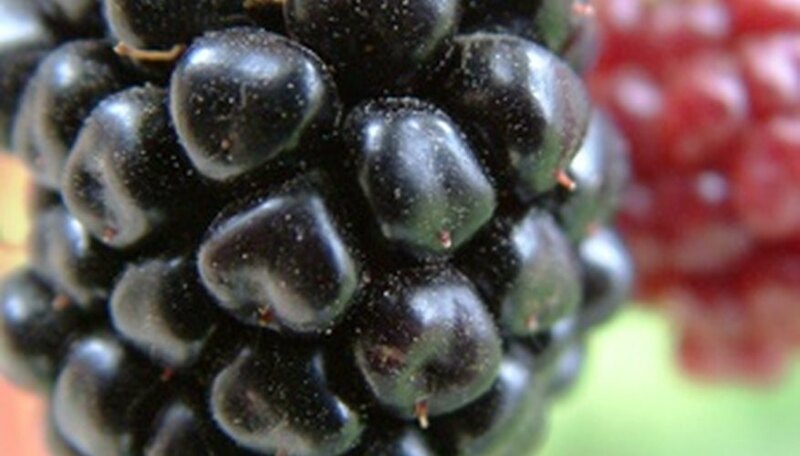 The blackberries are larger than other varieties with a fine-quality flavor. They are good for eating fresh and freezing. The plants are upright and thorny. Test the soil around your blackberry shrubs to determine the dirt's pH level. You can often find pH testing kits at many garden stores or your regional cooperative extension office (see Resources). Spread fertilizer around the roots of the blackberry shrubs in the early spring season immediately after the plants emerge from dormancy and begin producing new growth. Texas A&M University recommends using a 21-0-0 fertilizer if your soil pH is above 7.0, and a 15-5-10 fertilizer if your soil pH is lower than 7.0. Apply the fertilizer at a rate of 2.5 lbs. for every 50 feet of shrubbery row. 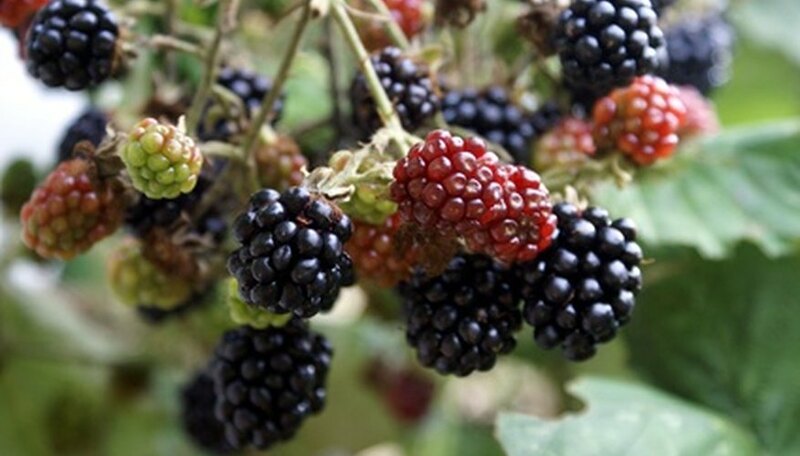 Water the blackberry shrubs lightly to moisten the soil to a depth of 6 to 8 inches. This helps carry the fertilizer nutrients down to the plants' root level for immediate feeding. Feed the blackberry shrubs again in early summer. This application is optional but will encourage more vigorous growth. For the second feeding, use a 21-0-0 product at a rate of 2.5 lbs. per 50 feet of shrubs, according to Texas A&M University.